One of the first American-bred hard rock groups to challenge British supremacy in the early ’70s, Montrose is remembered as, if not the most successful, then certainly one of the most influential bands of the era. In fact, many of the personalities responsible for the group’s legendary, self-titled debut (producer Ted Templeman, engineer Donn Landee, vocalist Sammy Hagar) would later become instrumental players in the formative and latter-day career of the mighty Van Halen. And to his credit, though he ultimately lacked the focus and leadership skills to consistently guide his band’s career, guitarist Ronnie Montrose was a true original on the instrument. His superlative playing aside, the avid big-game hunter lived the guitar-playing gunslinger lifestyle long before Ted Nugent made the combination famous. 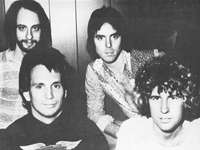 Hagar’s replacement was relative newcomer Bob James, but it was new full-time keyboardist Jim Alcivar who quickly placed his stamp on the group’s appropriately titled third album, Warner Bros. Presents Montrose! Released at the tail end of 1975 and produced by Ronnie himself, its pedestrian songwriting and generally plodding, tepid sound alienated what was left of the band’s remaining faithful and led to Fitzgerald’s departure soon after (he later became a member of Night Ranger). New bassist Randy Jo Hobbs performed on Montrose’s last-ditch effort, 1976′s Jack Douglas-produced Jump on It. Also poorly received and boasting a ridiculously ill-fated album cover to match, it never had a chance and the musicians soon went their separate ways. Carmassi joined Hagar’s solo band (also featuring Bill Church by then) and later played with Heart and many others. As for committed outdoorsman Ronnie Montrose, the guitarist took some time off to enjoy his other hobbies before releasing three albums with new band Gamma in the early ’80s. He recorded under the Montrose name once again for 1987′s Mean, a one-off affair featuring singer Johnny Edwards (later, briefly of Foreigner), bassist Glenn Letsch, and drummer James Kottak (soon to form Kingdom Come, and eventually a member of the Scorpions).